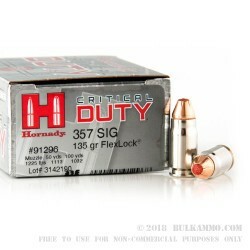 The Hornady Critical Duty line of 357 Sig ammo is the top choice for many officers in the field as well as thousands of shooters nationwide. Conceal Carry holders are also quite fond of these loads in many different calibers and for multiple firearms types. The Hornady “Flex-Tip” design in conjunction with Hornady’s “InterLock” band creates a copper jacketed bullet that has a lead core that is cast into it. 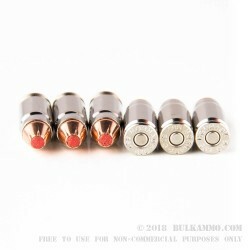 The 2 components are locked together in the manufacturing process and then the bullet has the famous red tip inserted, creating a powerhouse self-defense bullet design that is one of the top selling brands. 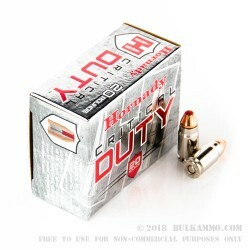 These Critical Duty rounds have another very important feature: The case is crimped right into a cannelure in the bullet, making it so, despite how many times the round is fed in and out of the chamber without being fired, there will be no “bullet set back”. “Bullet set back” is a dangerous condition that can happen when rounds are loaded and unloaded multiple times, but not discharged. Eventually, the bullet gets pushed deeper and deeper into the case, causing a very dangerous increase in pressure that can have multiple negative effects if the round isn’t noticed and removed from the mag or chamber. 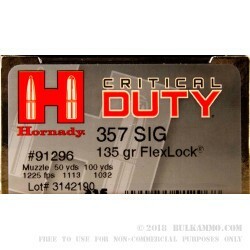 These Hornady 357 Sig Critical Duty loads are running 135 grain Jacketed Hollow Point or JHP Flex-Lock bullets. These bullets are loaded into brand new Hornady nickel plated brass cases that are Boxer primed, non-corrosive, and reloadable. Their muzzle velocity is 1225-feet per second, and a muzzle energy of 450-foot pounds. 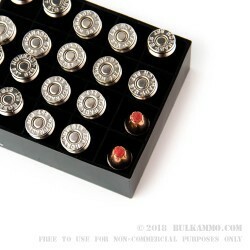 This 357 Sig ammo comes in 20 rounds boxes that are ready to load up into your CCW and stay by your side. Get yourself a few boxes to make sure you can load your extra mags too. Order your rounds today.